Netflix has taken to Twitter to tease the next nine episodes of Chilling Adventures of Sabrina, complete with a new trailer and episode titles. You can check it out in the post below! 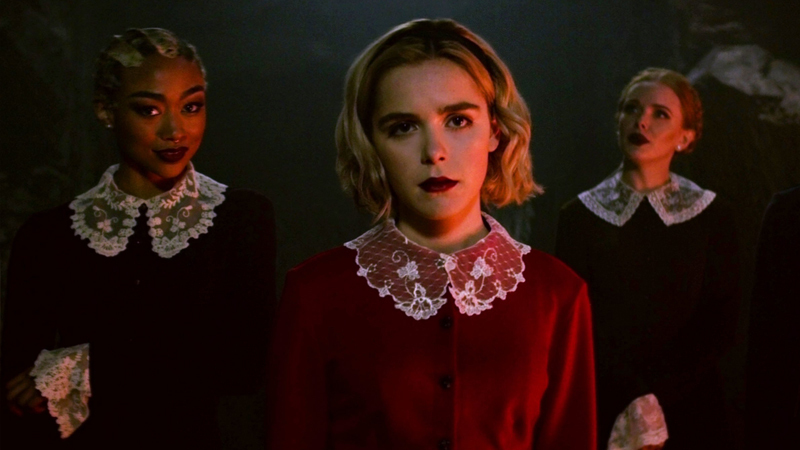 The upcoming episode titles are: “The Epiphany,” “The Passion of Sabrina Spellman,” “Lupercalia,” “Doctor Cerberus’ House of Horror,” “Blackwood,” “The Missionaries,” “The Miracles of Sabrina Spellman,” and “The Mandrake.” All nine new episodes of Chilling Adventures of Sabrina will be available starting April 5. The series, which stars Kiernan Shipka (Mad Men) in the titular role, was ordered to series by Netflix after initial development began at The CW in a two-season deal, with an agreement set to film both seasons back-to-back. The first season premiered on the streaming service on October 26 to rave reviews from critics and audiences for its dark visuals, creepy tone and Shipka’s lead performance. The adaptation is written by Roberto Aguirre-Sacasa (Riverdale), based on the comic book basis for which he also wrote and also serves as executive producer. Lee Toland Krieger directs and executive produces with Aguirre-Sacasa, Greg Berlanti, Sarah Schechter, and Jon Goldwater. The drama hails from the Warner Bros. Television-based Berlanti Productions. The upcoming third and fourth parts of the series will be filmed back to back in Vancouver as the first two seasons were and will enter production sometime next year. Chilling Adventures of Sabrina Part 2 is set to hit the streaming service on April 5, 2019.